The Test d’Évaluation de Français pour le Canada (TEF Canada) tests the French language proficiency of both native and non-native French speakers. 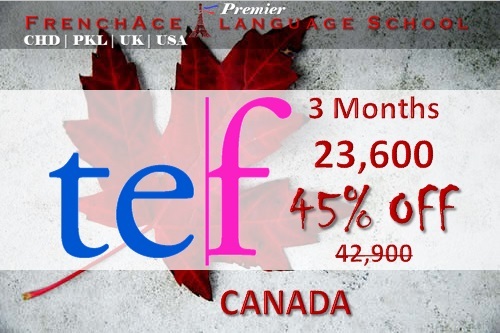 TEF Canada is recognized as official proof of language proficiency by Citizenship and Immigration Canada (CIC) as well as the Ministère de l’Immigration, de la Diversité et de l’Inclusion (MIDI) du Québec for permanent residency applications, certificat de sélection du Québec applications and Canadian citizenship applications. TEF Canada assesses the candidate’s level of proficiency using a 7-level scale based on the Common European Framework of Reference for Languages (CEFRL). These levels are described in detail for each skill (reading/listening/writing/speaking). For immigration to Quebec only, two modules are compulsory: Compréhension orale and Expression orale. It is a French Language Proficiency benchmark specific to Canadian and Québec Province in Canada for immigration procedures. You can now earn up to 30 additional points for strong French language skills (even if French is your second language). Since June 6, 2017, 15 bonus points are available to candidates with strong French language skills. 30 bonus points can be availed of by candidates with a proficiency in both languages. Achieve test results at Level 7 or higher in all four language skills (listening, speaking, reading, and writing) of the Niveaux de compétence linguistique canadiens (NLC). Receive an English language test result of CLB 4 or lower. Receive an English language test result of CLB 5 or higher. “French-speaking newcomers contribute to the growth, vitality, and prosperity of Francophone minority communities across Canada,” IRCC explained. Find out more about these additional points.